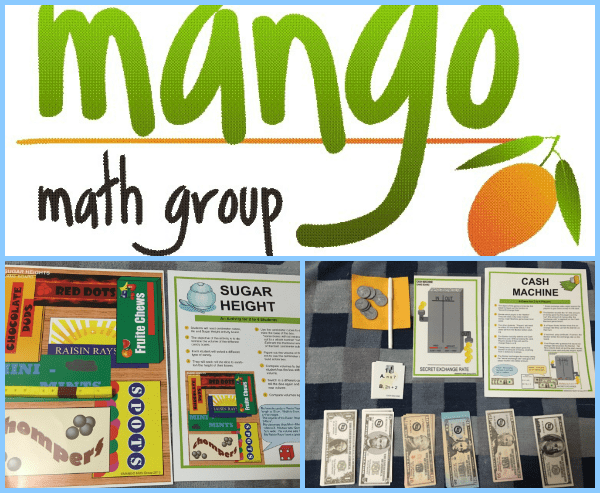 I was contacted by Mango Math, a K-5 math games company, to do a review on their 5th grade fun kid math games. The 2 games I received, Sugar Height and Cash Machine are from their 5th grade math crate. 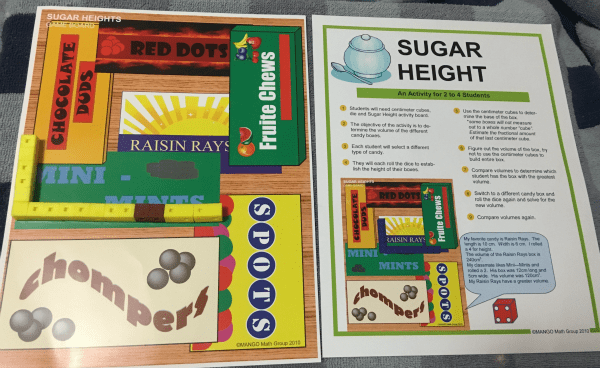 The Mango Math game, Sugar Height comes with an instruction card, the activity board, centimeter cubes (yellow and brown), and a red die. The objective: Measure volume by counting unit cubes using cubic cm. Relate volume to the operations of multiplication and addition and solve real world problems. Determine the volume of the different candy boxes. The game takes approximately 15 minutes. How the game is played: the kids determine the length and height of each candy box but they need to roll a die to produce the number for the height. This was a very fun game! As you can see from the image above, I used the yellow and brown cubes to record the height and width of the candy box “Mini Mints”. You can also see everything that I received for the game, except that there was a medium bag filled with the cubes. 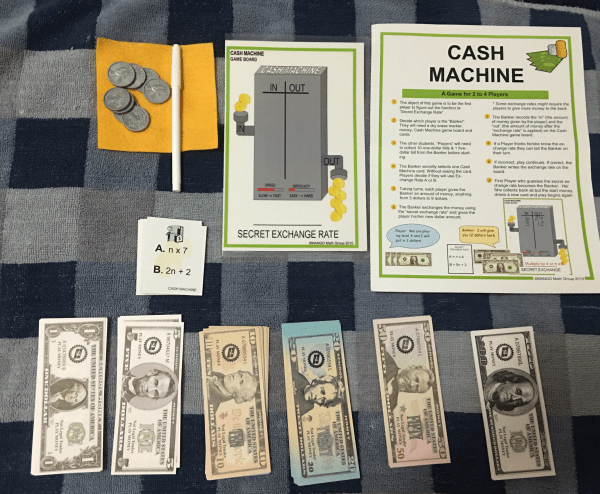 The Mango Math game, Cash machine comes with an instructions card, a dry erase game board with dry erase marker and cloth, math game cards, and a money bag containing quarters, ones, fives, tens, twenties, fifties, and hundreds. That is everything that I received in the image above. The objective: Generate numerical patterns using two given rules. Identify relationships between terms. How the game is played: the kids give the money to the banker who will exchange it for a new amount o money. The “secret exchange rate” math cards have two different levels of play; (a) which is the easy and (b) which is more difficult. The kids determine what “exchange rate” or “function” the banker is using. The banker writes the “in” and “out” amounts on the game board. I tried to play with Austin who’s in the 5th grade but apparently his class hasn’t learned exchange rates. So then I asked Cameron and he knew exactly how to play. If you look at the image above, (a) says n x 7, so if I’m the banker and Cameron gives me 3 ones, I will give him $21 back. Since n becomes 3, so then it reads 3 x 7, which equals 21. This is also a great money teaching tool, as they get older they need to learn how to count coins and know how to give change back.